WHAT CAN CNY, WALTER MITTY AND STEVE JOBS TEACH US ABOUT SUCCESS? What is creativity exactly? The late, great Steve Jobs famously said “Creativity is just connecting things”. It’s a rare commodity because most people are afraid of stepping outside of their comfort zones. If you never step out, you’ll always have the same old experience. The more you step out of your comfy zone be it your cushy job or your couch or whatever safe routine you got going on, the more diverse experiences you’ll have, and the more dots you’ll have to join. For me, this is also what that Ben Stiller movie, “Walter MItty” was about. He didn’t have an awful lot of dots but man did he collect them in a hurry! If creative people merely “see” the connections between previously unconnected dots then creativity must be alive and kicking in Singapore. 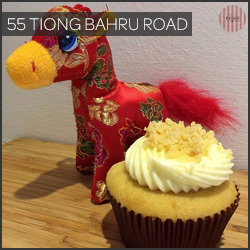 Who would’ve thought of connecting the bak kwa dot to the ice cream dot and the pineapple tart dot to the cupcake dot but obviously somebody creative saw something and went out and did something about it. Just like the “Cronut “inventor that literally joined the Croissant to the Donut all these people saw something that didn’t exist before and then went out there to to realize what only existed in their dreams. You need dots and some creativity to join them but a great idea alone is nothing. You need execution too. And when you break execution down, it’s really just a series of mini-ideas that make up the big one. Whatever it is, only time and the market will tell if these ideas will be a success. Oh I did forget one last thing. It’s CNY and if it’s one thing the Chinese keep going on about it’s about superstition and luck. Luck and timing are often overlooked by those venturing out into new territories business-wise or life-wise. To y’all out there that are going out collecting and connecting dots in the year of the horse, Gong Xi Fa Cai (congratulations on your wealth) , Wan Shi Ru Yi (May all your wishes be fulfilled) and Da Ji Da Li (Good luck and smooth sailing). Why are they even called love letters anyway? Shouldn’t this be a Valentines Day snack instead? 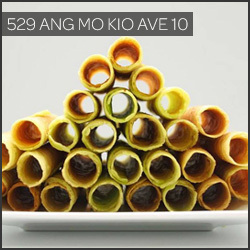 Added with the aromatic smell of pandan, this is indeed love at first bite. How about a little sugar, spice, and everything nice? This is what you’ll end up with – Spicy Bakkwa ice cream. 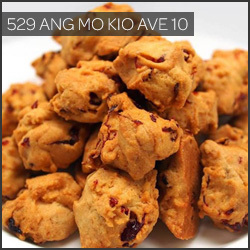 What do you do with leftover bak kwa (if that’s even possible) and cookie dough? Well, you combine them of course! Is it a cupcake or a pineapple tart? You decide. You may need to try more than one before a decision can be made on this tartcake. 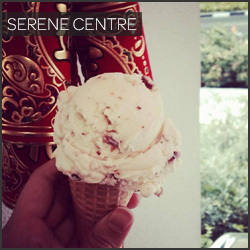 Fancy an ice cream in this blistering weather in your swanky new CNY clothes? 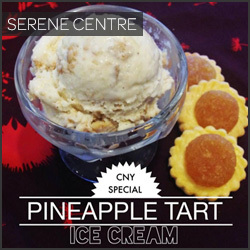 Try a pineapple tart ice cream. It’s like eating sub-zero temperature pineapple tarts. Who says CNY goodies are always unhealthy? 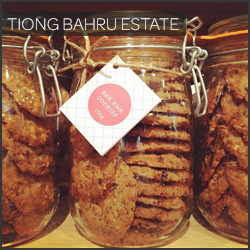 A combination of Red tea infused cookies and Roselle flowers fixes your cravings while looking after those calories.